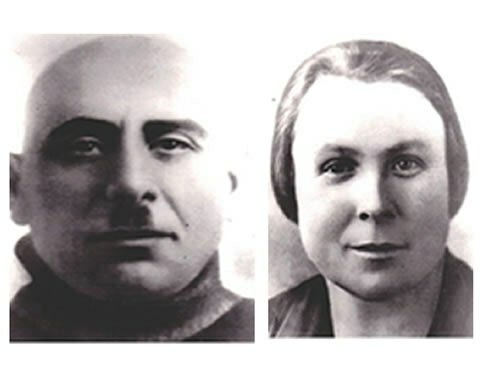 who both perished in the Minsk Ghetto, March 1942. Why do I mourn? This is the story of my family and of so many others. It all started on June 28, 1941, when the city of Minsk (the capital of Belorus) fell to the German invaders. During the German occupation, some 40,000 men and boys between the ages of fifteen and forty-five were assembled for "registration". This was done under penalty of death; all of them were Jews. On the fifth day, members of their intelligentsia were ordered to step forward. They were promptly marched off to a nearby forest and shot: it was a foretaste of things to come. On July 8, the Germans killed 100 Jews. The murder of Jews by the Germans, either single people or in groups, became a general occurrence. Jewish men and women who married non-Jews were also taken to the ghetto, as well as their children. All in all, the ghetto population eventually reached 100,000 in number. Among them, was my great-grandfather Motel and my great-grandmother Shaina along with their children. Daily, the men of the Einsatzgruppe were shooting thousands of Jews.The strain was too great. A more "humane" method had to be found. This was not only for the benefit of the victims, but for that of the perpetrators as well. The Nazis created a self-sufficient gassing van, where the exhaust fumes of the van’s engine were re-directed into the sealed rear compartment of the vehicle. The systematic murder of Jews commenced in the gas vans. Hundreds of people were lined up daily for their last ”journey”. The Germans warned that if anybody would try to escape, the 10 people standing in front of that person, and the 10 people behind would be killed right away. On March 2, 1942, at least another 5,000 victims were lined up, which was timed to coincide with the Jewish festival of Purim. My great grand-parents found out that their two sons, Joseph (18 years old) and Boris (14 years old), had been placed in the line. My great-grandmother gave a policeman her gold chain (which was all she had) and begged him to let her and her husband take the place of their children. The policeman took the gold chain and let the quick exchange happen. October 21,1943. According to the statistics of the Nazis , 86,632 Jews had been murdered in Minsk during the occupation as well as February 1, 1943. My great grand-parents were among them. They sacrificed their own lives to save my grand-uncle Boris and my grand-father Joseph.